Vintage Cottage/House ,...Dock and Mooring! SPECTACULAR VIEWS! 1800's restored Vintage Summer Cottage/House sits up high on the rocky shoreline of Westport Island in the mid coast area of Maine. SPECTACULAR VIEWS of surrounding Islands, Working Lobster Boats and Harbor Seals. There is also easy access to the water and a dock. Hendrik's Head Lighthouse and the open Ocean are directly south and easily visible. The wonderful southeastern exposure allows stunning views of the water, wildlife, boating traffic and the sunrise from every window! Airy and spacious rooms with cottage furniture and antiques. Central heat. A large wrap around porch on the West side of the cottage, to watch the sunsets. There is a deep water dock on a beautiful peninsula overlooking a cove to the north of the cottage and a mooring for your boat. The main cottage is 4 bedrooms, (3 Queens and a King) and a single bed on the enclosed porch. The attached unit has a full kitchen, a waterfront deck and it sleeps 4. It is accessible from the main cottage or from a separate outside entrance. Cleanliness! : I have had the same reliable wonderful cleaning gal for 23 years. The cottage is always spotless and mattresses are new, comfortable atnd completely covered with high quality mattress protectors. This cottage has been rented each summer for 23 years! It is a 5 star EXCEPTIONAL property! We have been renting this cottage as a weekly vacation rental for 26 years. We have never received anything other than a 5 star review! We strive to give our guests the best Maine Experience available! EVENT PACKAGE:!! Lodging for up to 12 guests for a week. Event for up to 75 Guests. Saturday to Saturday rental in Peak Season. Flexible in Off season. $7999.00 plus taxes. REFUNDALE damage deposit. Call for details..
We had a great time, the property was exactly as advertised. Spectacular views. Truly one of the best places to get away with he family and enjoy everything the coast line of Maine has to offer. We weren't prepared for such an incredible setting. Lobster boats cruising the shoreline, seals basking on the rocks and Osprey soaring above were enough to make it memorable. Couple that with an adorable 'cottage' (and I use that term loosely -- it's quite generous in size and amenities) -- well, it all made for a terrific family vacation. We were there during a bit of an unsettled weather pattern and without air conditioning, we stayed a bit 'damp' -- but we spent much of the time out and about and kept the fans running so it was fine. The house was so well stocked that we only needed to purchase groceries. Overall, we had a wonderful time laughing, relaxing and making memories along the way! Thank you Ellen! Our group of seven (five teenagers and two adults) loved Ellen’s home. Any question was answered within minutes. Prior to arrival, Ellen sent information about what to do while visiting and we managed to do almost everything. Her recommendations were spot on. The weather was perfect at 75 during the day and 55 at night (we actually slept with the windows open) which was a wonderful break from the oppressive Florida summer heat. Thank you Ellen! Twelve of us (6 adults and 6 kids) stayed at this beautiful location in Mid-August. We had a blast! The fire in the fire pit, every night, was perfect. The kids loved fishing for Mackerel off the dock (and, we even caught a few small Stripers off the dock!). Kayaking and seal watching was a treat for everyone. Our fishing charter boat came right to the house and picked us up for a full day of fishing - great service! Could not recommend more for a coastal Maine vacation. Ellen was a pleasure to deal with and had great advice for us, at every turn! Beautifully maintained, historic bay front home perfect for family and friends. Filled with antiques and hidden spots for reading or enjoying a drink. Adirondack chairs spread throughout the property which also includes a fire pit, hidden trail to shoreline, and lobster pot for lobsters you can pick up at local co-op. One of my favorite memories...spreading a blanket on the bluff in the backyard and watching the seals on a rocky outcrop in the middle of the bay. Beautiful property. The house is very large and the rooms are much more spacious than the photos make it look. Especially the effiency apartment. Beautiful views, very private. The owner was very accomodating and answered every single email promptly and mailed out a packet of things to see, do and eat at...very well done. The yard is very large and although we had made reservations for dinner one night, we canceled them in order to have our own mini clam bake outside....perfect weather. The only thing it lacked was a cribbage board and deck of cards.....we left both behind. I would definitely recommend staying here...be sure to claim the bedroom with the balcony! The bridge to Westport Island is located 3 miles down off Route one, between Bath and Wiscasset. The cottage is 7 miles from the bridge. 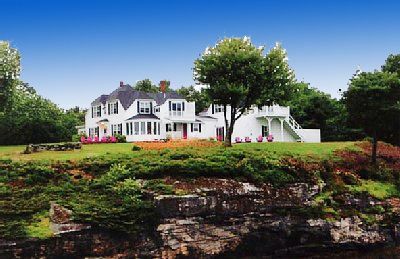 Our 3.5 acres of vast green lawn, stonewalls and 800 feet of deep water frontage offer privacy and spectacular views of the Maine Coastline and Sheepscot Bay...looking out to open Ocean. The island itself has only a General Store, Country Inn and Town Hall, but we are close and convenient to all of the attractions that the midcoast has to offer. Sheepscot Bay is a Boater's Paradise, with beautiful islands and easy access to the open ocean by boat.